"John Coltrane's sound rearranges molecular structure." Abramorama has released an official US trailer for the documentary titled Chasing Trane, an extensive look at the life of jazz legend John Coltrane. This doc first premiered at the Telluride and Toronto Film Festivals last year, and is a must-see for any die-hard jazz fans. It features tons of rare footage and photographs of Coltrane practicing and performing, including a never-before-seen studio tape found in a garage during the making of the film. Even if you're not that familiar with Coltrane, this doc spends plenty of time telling us who he is and why he was so passionate about music. The film is produced with the full participation of the Coltrane family and the support of the record labels that collectively own the Coltrane catalog. It's not the best doc, but it is a nice look at a legend. Featuring never-before-seen Coltrane family home movies, footage of John Coltrane and band in the studio (discovered in a California garage during production of this film), along with hundreds of never-before-seen photographs and rare television appearances from around the world, Coltrane's incredible story is told by the musicians that worked with him (Sonny Rollins, McCoy Tyner, Benny Golson, Jimmy Heath, Reggie Workman), musicians that have been inspired by his fearless artistry and creative vision (Common, John Densmore, Wynton Marsalis, Carlos Santana, Wayne Shorter, Kamasi Washington), and many others. Chasing Trane is directed by documentary filmmaker John Scheinfeld, of The U.S. vs. John Lennon, Who Is Harry Nilsson, and I Hope You Dance: The Power and Spirit of Song previously. This first premiered at the Telluride and Toronto Film Festivals last year. 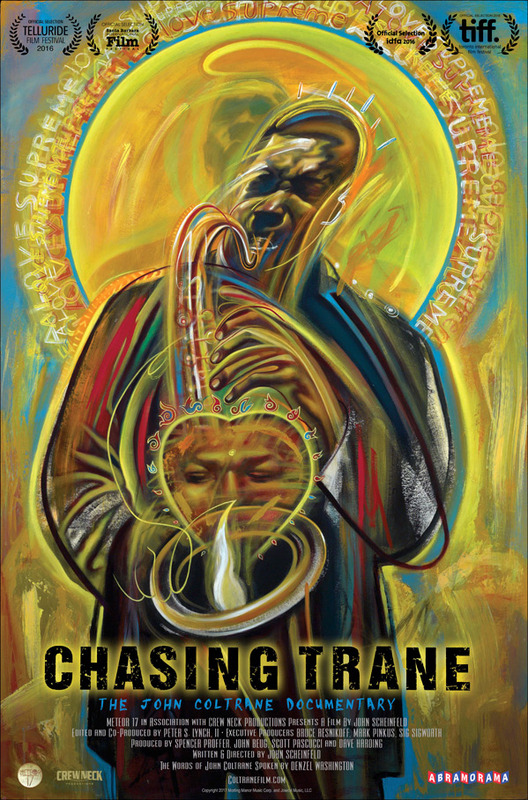 Abramorama will debut Chasing Trane in select theaters starting April 14th this spring. Check your local art house cinema. Any jazz fans out there?